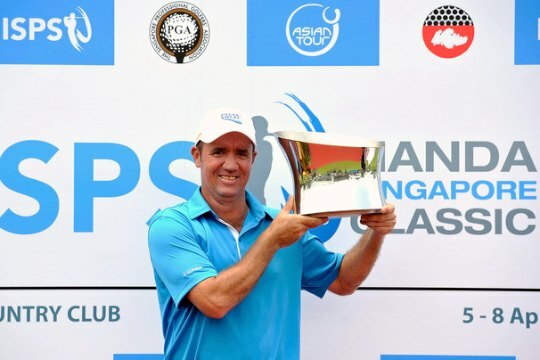 Australia’s Scott Hend described his week in Singapore as one of the most amazing in his life after he closed with a six-under-par 64 for a 1 shot victory in the weather-shortened ISPS Handa Singapore Classic on Sunday. The US$400,000 Asian Tour event was reduced to 54 holes after inclement weather caused almost 10 hours of play to be lost over the first three days at the Orchid Country Club. “It’s amazing especially to have four weeks off and come back and win. It’s great to see some of the hard work and practice that I’ve put in paying off.” Hend said. Hend had to wait for close to an hour before he knew he had secured his second Asian Tour title with a winning total of 11-under-par 199. As many as three players were still in contention for either a play-off or win after Hend had signed for his score and it was a wait that seemed like an eternity for the big-hitting Australian. “It’s sort of like you’re going out and have to wait for your wife to do her hair or something. You’re just sitting around and pacing around and that was what I was feeling then,” said Hend. “I just wanted it to be over and know whether I’ve won or not. Luckily for me, I won,” added Hend. Sri Lanka’s Mithun Perera, Chinese Taipei’s Lu Wei-chih, Spain’s Javi Colomo and David Lipsky of the United States all finished in a tie for second at 10 under par, a shot behind Hend. The Australian’s week was further sweetened when Dr. Haruhisa Handa, Chairman of ISPS, announced that he will gain a sponsor’s invite to the ISPS Handa Wales Open on the European Tour in May. Meanwhile, Perera was almost loss for words after he signed off with a flawless 65 for his best finish on the Asian Tour. The Sri Lankan, who managed to play through an invite spot this week, made the most of his opportunity and was duly rewarded. “I’m really happy about the week as I played really good golf,” said Perera.